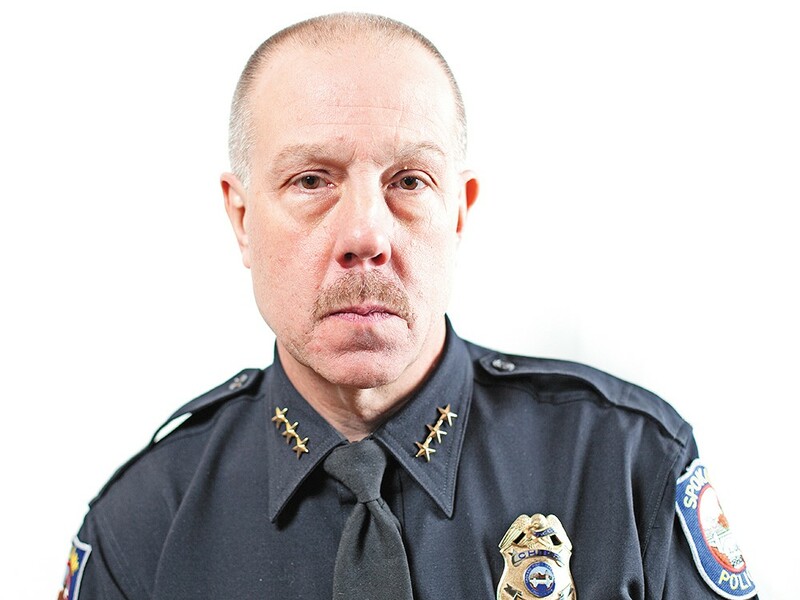 Spokane Police Chief Frank Straub: \"We want our officers to carry a variety of weapons systems.\"
Armed with $1.1 million in newly approved funding, the Spokane Police Department plans to invest in standardizing weapons equipment, installing dashboard cameras in patrol cars and expanding officer training programs. The City Council approved the money from reserves last week to pay for equipment and training in response to recommendations from the city’s Use of Force Commission. An SPD spending memo outlines how the money will be used. About $600,000 will go toward installing 70 dashboard cameras in patrol cars along with initial licensing, server and video storage expenses. The department estimates an ongoing cost of $150,000 a year for full-time staffing and maintenance. While many community groups — including the Use of Force Commission — have strongly supported the use of officer-carried body cameras, none of this initial spending will go toward body cams. Spokane Police Chief Frank Straub has argued in-car dashboard cameras serve as a more reliable initial step toward recording officer interactions. Police officials say they hope to pay for body cameras, along with additional police officers, through a voter-approved tax levy in November. The details of the proposed levy have not been finalized. Another $135,600 of the new funding will go toward standardizing “weapons systems” issued to officers, replacing Tasers and batons with smaller models. Straub says the department’s current weapons systems are bulky and inconsistent from officer to officer. He says providing smaller Tasers and batons will make them easier to carry and use. The department plans to spend $110,600 to provide smaller Tasers for 104 officers now carrying older Taser models. The cost per Taser is equivalent to about $1,060. Officials will also spend about $25,000 to purchase 190 collapsible batons and carrying pouches, costing about $130 each. Another $5,280 will go toward training officers on how to use the new, smaller batons. The department plans to spend an additional $151,000 on a virtual Firearms Training System, an interactive videogame-like simulator, which can present mock law enforcement scenarios on a 360-degree screen. Approximately $120,000 will go toward training programs and travel, paying for $42,000 in leadership courses and $30,000 in de-escalation training for Spokane officers. The training is listed as a response to the Use of Force Commission’s concerns about police culture and force practices. Commission Chairman Earl “Marty” Martin says he is encouraged by the department’s initial progress.